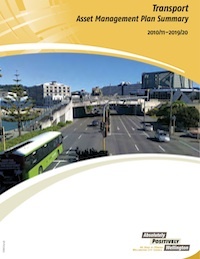 The New Zealand Transport Agency – State Highway Asset Management Plan is available here. The Asset Management Plan includes a framework for the document that depicts each section and the relationship to other sections and to the plan as a whole. Sections include descriptions of the agency assets, programs, demand, performance, risk, prioritization processes, improvements, implementation, and the link between existing plans. The AMP also includes a statement of intent, covering a list of desired impacts, with key progress indicators and targets for the agency. This document includes the following sections: Asset Valuation, Communications and Reporting, Future Demand, Introduction, Inventory and Condition, Investment Strategies, Objectives and Measures, Performance Assessment, Process Improvements, Risk Management. • Presents a corridor view of asset management. The asset scope of this document is: Highway Assets, Includes other highway assets.